Baltimore is both famous and infamous for its Inner Harbor waterfront. The city draws thousands of tourists to its historical harbor attractions, but the water is so polluted that you need to keep a safe distance. The harbor consistently receives a failing grade in its annual Chesapeake Bay Report Card, which has spurred citywide efforts to improve the state of the water. The Healthy Harbor Initiative, a joint effort to combat Baltimore’s water pollution, is working toward a “swimmable and fishable” harbor by 2020. 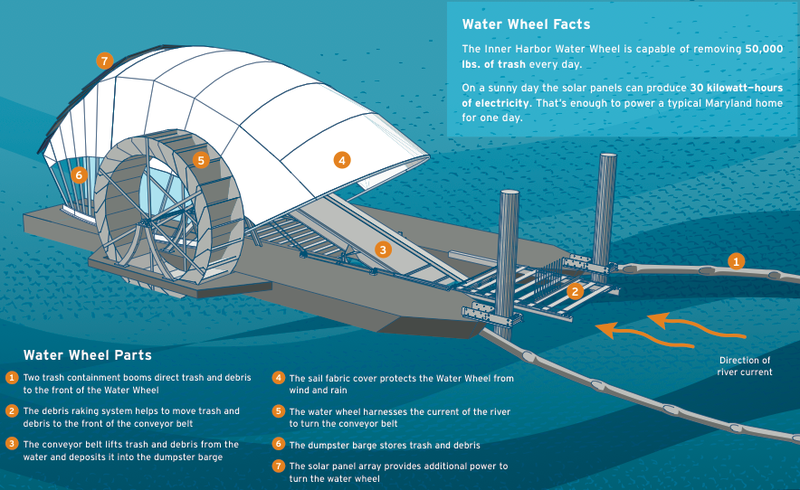 Its star attraction at the moment is an odd one: a solar-powered water wheel trash interceptor, introduced in May to the Inner Harbor landscape in an effort to reduce trash and improve water clarity. The Inner Harbor water wheel is the only machine of its kind in the world. It harnesses the power of water and sunlight to pick up litter and debris flowing out of the Jones Falls, a river that runs through eastern Maryland. See the water wheel in relation to the entire Jones Falls watershed. Litter is diverted towards the wheel, picked up, and deposited in a dumpster barge. The wheel is capable of removing 50,000 pounds of trash every day, but isn’t exclusive to trash cleanup, either—it also helps put oxygen back in the water, removes organic waste, and educates people about the pollution happening in Baltimore. Some days are worse than others— this video shows the water wheel working in a rainstorm. You can see how the water wheel has already collected more than 101 tons of trash! Videos like this are helping spark interest in Baltimore’s cleanup efforts. Hopefully, this will lead to a more concerted effort by the public to reduce litter and help keep the entire watershed clean. The popularity of the water wheel is helping combat one of Baltimore’s biggest obstacles to cleaning up the harbor—public awareness. The wheel demonstrates that people near and far have impacts on the water and aquatic life throughout an entire watershed. Some of what the wheel picks up has traveled from the very edges of northern Baltimore County. As more people start to understand where the trash comes from, more can be done to prevent it. Any of us can play a positive role where we live, as this problem exists elsewhere. One way to get involved is through citizen science. Whether it’s monitoring water quality in a local stream, or cleaning and greening schools and neighborhoods, the best way to get involved is to explore and understand our connections to our environment. The Baltimore wheel and the Healthy Harbor Living Laboratory which includes floating wetland islands, constructed waterfalls, and rain gardens to help manage stormwater runoff, have already made improvements. As oxygen, bacteria, and nutrient levels improve along with water clarity, iconic species such as oysters and Atlantic menhaden (a type of fish) are returning. This activity can help visualize these health indicators and can encourage discussion about what may be causing those changes. A cleaner Baltimore Harbor can bring back a diverse community of aquatic life, and it can also spur economic growth with increased ecotourism. Other living laboratory projects are cleaning and greening Baltimore’s Inner Harbor, making it more enjoyable to live and visit. Baltimore is not going to stop at just the water wheel—the city hopes that this will be the start of a long-term behavioral change that limits upstream trash pollution. If the Healthy Harbor Initiative works, surrounding communities will reduce litter, improve waste disposal practices and put the trash wheel out of business. Follow the trash wheel on Twitter @MrTrashWheel to see what it’s like being the Harbor’s trash receptacle.